Credit Suisse is to cut more than 2,000 jobs - or 4% of its global workforce of 50,700 - by the end of next year in an attempt to make savings. The announcement came as the Swiss bank reported a 52% year-on-year fall in net profit to 768m Swiss francs ($959m; £586m) in the second quarter. Its results were hurt by a strong currency and a drop in trading. Earlier this week, fellow Swiss bank UBS hinted at job cuts after announcing plans to reduce costs by up to $2.5bn. 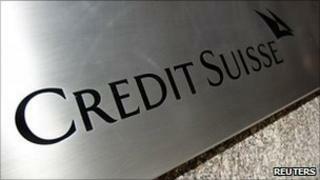 Credit Suisse's results were worse than analysts had expected. Revenues fell 25% to 6.3bn Swiss francs in the quarter, with revenues from trading down 69%. "We have to recognise the likelihood that the current headwinds in the economic and market environment may be more persistent than we would have hoped," said chief executive Brady Dougan and chairman Urs Rohner. "We expect interest rates to remain low for an extended period of time and the strong Swiss franc to continue to have an impact on our results. We may also continue to see lower levels of client activity and a volatile trading environment." The job cuts are part of a programme designed to make savings of 1bn Swiss francs in 2012. The bank said the cuts would hit all divisions but particularly its investment bank, whose performance was "below expectations". They would also be made in all regions, with 500 of the losses to come in Switzerland.